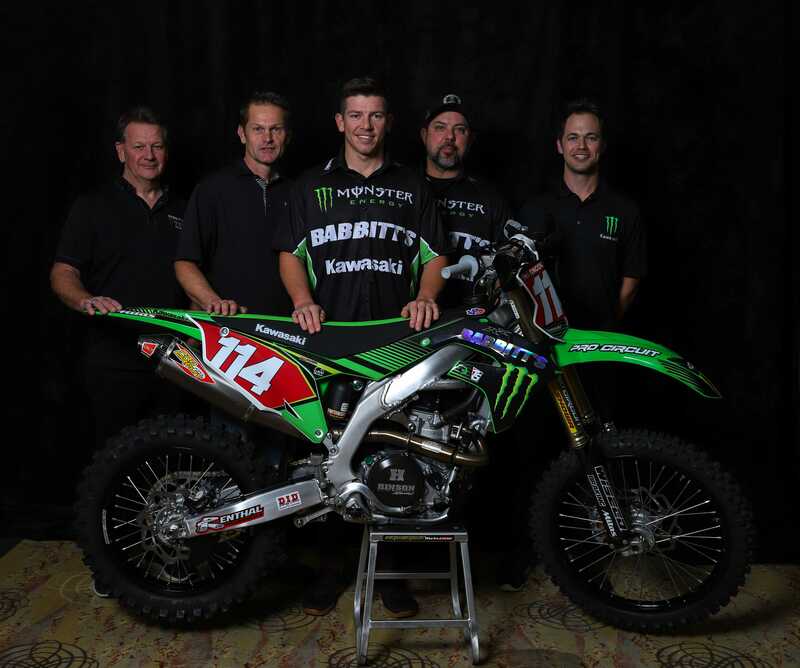 Following the team introduction at the Grand National Cross Country (GNCC) banquet, Kawasaki Motors Corp., U.S.A. is pleased to introduce the Team Babbitt's/Monster Energy®/Kawasaki Team Green™ effort that will field two XC1 class riders in the 2019 GNCC and Full Gas Sprint Enduro Series. With this effort, Kawasaki will continue a long and successful racing relationship with Team Babbitt's Online where they captured eight of the last nine AMA Arenacross Championships from 2010-2018. Joining the team aboard his all-new KX™450 motorcycle will be former GNCC XC1 Champion and current Full Gas Sprint Enduro Champion Josh Strang. "I'm very excited for the opportunity to ride the all-new KX450," said Strang. "It's exciting to join a team like Kawasaki, who believe in the potential of my riding and my results. I rode Kawasaki's in Australia for many years before moving to the U.S. to race, so it's really gone full circle for me. I can't wait to get back on a brand that helped start my career and continues to provide support, which is a big part of succeeding." In addition to the Team Babbitt's Online racing effort, Kawasaki Team Green™ will have a lot to offer off-road racers, including a $1.7 million racer rewards program with $427,700 dedicated to the GNCC series. The Team Green trackside support crew, featuring technical assistance and parts sales for customers will attend seven rounds of the 2019 GNCC series as well as other off-road race events across the country. For GNCC events where the Team Green trackside support crew is not present, the Team Babbitt's Online semi will have a supply of OEM parts to assist KX™ customers in need. To further support our customer, racers can visit their Kawasaki Team Green dealer to earn up to a $1,500 rebate for the purchase of a new 2019 KX model. Kawasaki Team Green dealers have until February 15, 2019 to submit Racer Support applications. "We have been working hard to put these programs together and re-establish our presence in the off-road segment," said Team Green Manager Ryan Holliday. "Having the opportunity to continue our successful relationship with Team Babbitt's Online and be involved with the GNCC series was an easy decision for us. The combination of having a great new KX450 model, experienced riders and the knowledge of our team staff gives us the potential for success right away." Team Babbitt's/Monster Energy®/Kawasaki Team Green along with the Team Green trackside support crew will take on the treacherous terrain of the Big Buck GNCC season opener in Union, South Carolina on February 24, 2019. Babbitt's Online/Monster Energy®/Kawasaki Team Green™ lined up this past weekend for the second round of the Kenda Full Gas Sprint Enduro Series at Moccasin Creek in Blackshear, Georgia. Defending series champion, Josh Strang took on the 12 different tests over the two days of racing and was able to land on the overall podium in second place. The Babbitt's Online/Monster Energy®/Kawasaki team made its off-road racing debut this weekend at the opening round of the Kenda Full Gas Sprint Enduro Series at the GTR Complex in Gaston, South Carolina. Defending series champion, Josh Strang took on the 12 different tests over the two days of racing and was able to land on the podium in second place overall. After an unusually damp opening round in Anaheim, the 2019 Monster Energy® AMA Supercross, an FIM World Championship resumed for action in the covered State Farm Stadium of Glendale, Arizona. Monster Energy/Pro Circuit/Kawasaki rider Adam Cianciarulo, dominated the day by taking his 250SX Heat race from holeshot to checkered flag and would replicate that performance in the 250SX Main Event to capture his first victory of the season. Kawasaki Motors Corp., U.S.A. is pleased to announce the Chaparral Motorsports/Precision Concepts/Kawasaki Team Green™ effort that will field three riders 2019 WORCS and Sprint Hero Series. With this effort, Kawasaki will continue a successful racing relationship with Precision Concepts where they captured 11 professional off-road championships since inception in 2009. Robby Bell, a former three-time WORCS champion and longtime Kawasaki Team Green racer will lead the charge serving as team manager. During the off-season, the team signed former Kawasaki Team Green amateur rider and one of off-road racing's hottest prospects, Zach Bell. Returning to the team for 2019 are Blayne Thompson and recently crowned West Coast GP Pro 2 champion Clay Hengeveld. Zach Bell and Thompson will both pilot the all-new 2019 KX™450 motorcycle in the Pro Class; while young-gun, Hengeveld will be aboard the 2019 KX™250, contesting the Pro 2 Class.